It is mid-August and it is the fag end of Mango season. Most of the mangoes now in the market are overripe or have marks where rot sets in very fast. End of the season Mangoes have a very poor shelf life. These mangoes are best to make Jam or any sweet dish that uses mango pulp. 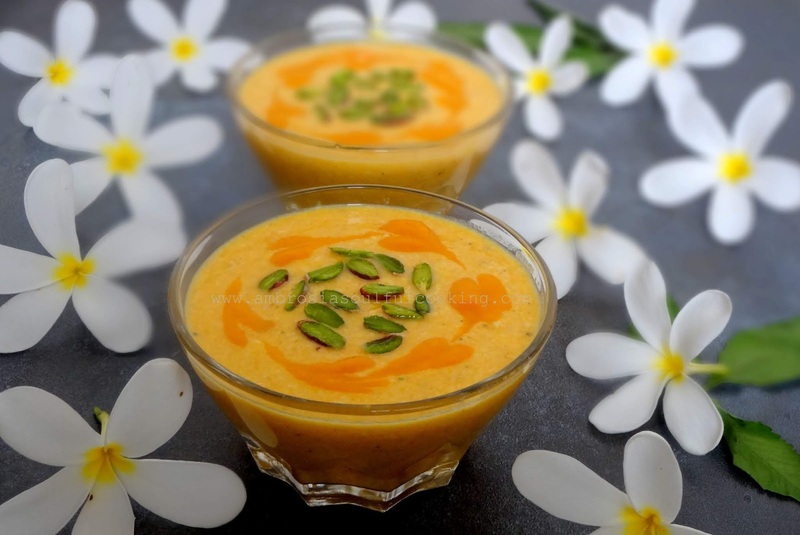 Cream of Mango or Mango Rabri is a traditional Indian dessert prepared with reduced milk and It can be made healthier by using low-fat milk or toned milk. Sugar can be substituted by a healthy sweetener like stevia drops. If the Mangoes are very sweet then the quantity of the sugar can be reduced. 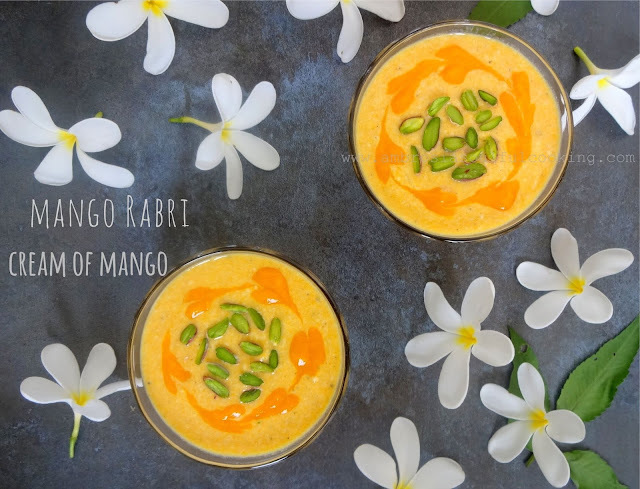 Another way of making Mango Rrabri a healthy dessert is to add 2 teaspoons of powdered oats when milk reduces to half. It will thicken the milk faster. You may add 1 teaspoon cardamom powder to the pudding. But plain pudding has a lovely flavour of the mangoes. Take milk in a heavy bottomed vessel (preferably a steel vessel). Let it boil till it becomes thick and the colour changes to light cream. Keep stirring and scraping the sides of the vessel. The milk should reduce to one-third of the original quantity. Once the milk is thickened, let it cool. In the meantime, peel the mangoes and remove the pulp. If the mango has a lot of strings, it is best to strain it to get a smooth pulp. 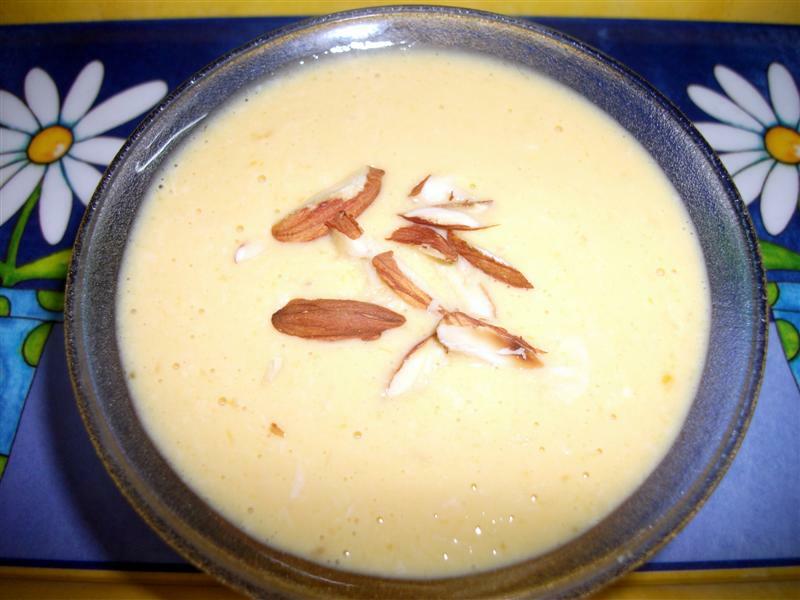 When the thickened milk has become cold, add mango pulp. Mix well. Add sugar to taste. Pour in the serving bowls garnish with toasted nuts.